A clear and detailed historical map of all of Galicia and Bukovina, undated from about 1910. Printed at large scale in four colors and published in booklet form by the firm of Rudolph Lechner and Wilhelm Müller, a Viennese producer of fine books, maps, photographs, and chromolithographs for private, commercial, and imperial use. The map classifies settlements in seven grades of size and importance; roads, rails, canals, and rivers of several sizes each; towns with significant religious and administrative buildings; and elevations of key town centers across the region. Also included are detailed views of the principal cities of Lemberg, Krakau, and Czernowitz at 10x scale. The original paper document is preserved in the Copernican Regional Library in Toruń; this digital scan is by the Kujawsko-Pomorska Digital Library. Original map in the public domain. 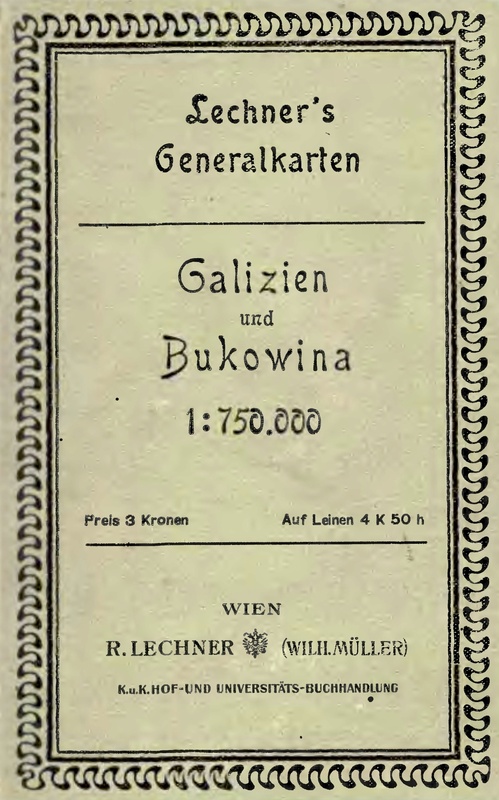 Digital scan by the Kujawsko-Pomorska Digital Library. Online interactive map © 2016 Gesher Galicia, Inc. For more information, visit the Gesher Galicia Map Room.